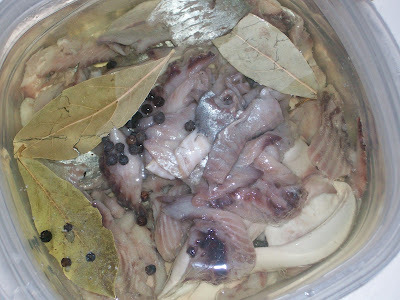 I cleaned the other two fish and now I'll show you how to prepare salt herring my father's way. Here is everything you need: The cleaned herring, cut into morsels. Plain vegetable oil. An onion. Whole black peppercorns. Bay leaf. 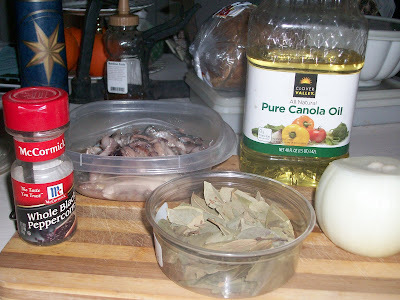 Pour oil over the herring to cover. Toss in about 20 - 25 peppercorns and two or three bay leaves. Slice the onion as thinly as you can. I only used about half of the onion pictured. 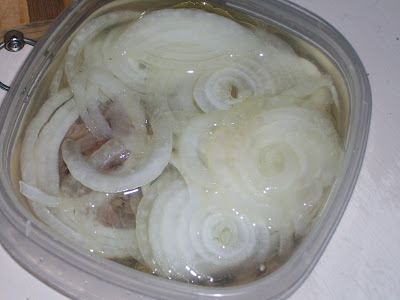 Add the onion to the herring, put the lid on and shake the container gently to make sure everything is covered in oil. Then place the container in the refrigerator, wait patiently for two days, or at least til the next morning, and voila! Herring the best way you can make it! I'll show you the finished herring tomorrow. In the meantime, here are some links. 1. Bavaria Sausage. As of this writing, their website says they are sold out of this product. Apparently the container is being redesigned and should be available in April. The company invites you to order now and they will ship when available. 2. "How to Fillet a Salted Herring" from the Enjoy Your Cooking website by Julia Volhina. I enjoy this website a lot. She has lots of recipes for all kinds of Russian food. 3. I mentioned Matjes herring in yesterday's post. It is the other acceptable way to enjoy herring. Yum. It is a little bit sweet and a little bit tart, being cured in a wine vinegar. And salty, of course. This picture comes from Russian Food Direct. You'll probably find several items that will strike your fancy. 4. Finally, I found this website when it looked as though Bavaria Sausage was not going to carry salt herring anymore. I think I am going to try this place the next time I order herring. The advantage of Nordic House is you can buy by the pound, rather than the whole container. 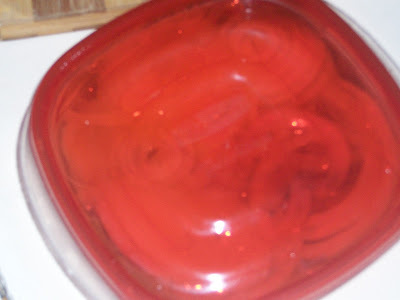 This makes it perfect for people who have not tried it before and just want to get an idea. Next post, we eat...... can't wait!